WHAT DO I NEED TO USE NASAL~FLOW®? For use NASAL~FLOW® it is necessary to access from a computer device, tablet or smartphone. To access it is necessary to use a web browser and internet connection. 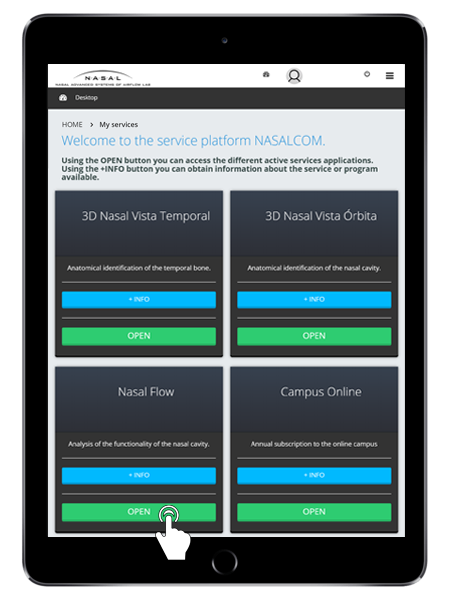 To access NASAL~FLOW® you need to register as a user in the NASALCOM online system (Go to NASALCOM section). It’s not necessary to install any other software for the use of NASAL~FLOW®. Se puede utilizar con cualquier sistema operativo, ya sea Windows, Linux o Mac OS. To use the tool in REQUEST CASE mode is necessary Google Chrome web browser, for other features you can use any web browser. By clicking in OPEN button of NASAL FLOW we access to the platform desktop. This desktop is the center of all functionalities: configuration of user profile, request cases, status of cases, postprocessed viewer and purchase of credits NASAL~FLOW®. This tab shows a list with all the cases requested by the user and the state in which they are. This tab allows to make a request to obtain the results of a study of airflows in the nasal cavity. 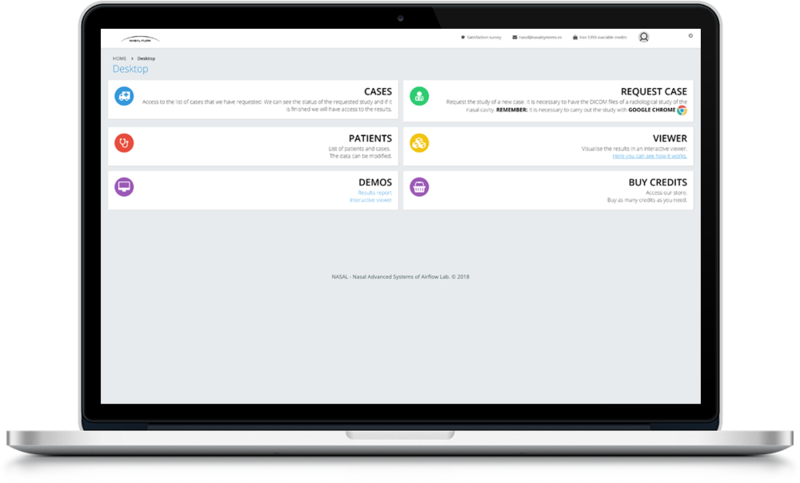 In this tab you can edit the patient records and the cases requested by the user. This tab allows you to see the results of the study through an interactive 3D viewer. In this tab you can see a sample report as well as use the viewer with the same case. This card allows you to buy credits to be able to carry out respiratory airflow studies. HOW TO BUY NASAL~FLOW® CREDITS? To use NASAL~FLOW® is required credits in the user account. Each credit is equivalent to a study of respiratory flows and their purchase is made through in the online service NASALCOM. To start the purchase process we must access NASALCOM with our username and password. On the NASALCOM desktop click on the OPEN button of the NASAL~FLOW® section. In the next page clic in BUY CREDITS button to start the purchase of credits for NASAL~FLOW®. Select the number of credits you need and clic in BUY CREDITS button to start the payment process (if you do not have all your billing information in your user profile you will be instructed to complete them before continuing the purchase). The payment method is by credit card. On the next page enter the card details to complete the purchase. Once the purchase process is completed correctly, the credits acquired will be automatically added to your user. To see the number of credits you have available, access the NASAL~FLOW® section and in the top right corner (next to the username) the credits you have available will appear.